JEECUP Results 2018 : Uttar Pradesh Joint Entrance Examination (UPJEE) Council Polytechnic Results Name wise With Score/ Rank Card and Cutoff Marks Category wise released at jeecup.org, jeecup.nic.in Websites. Students should follow below updates to get JEECUP Marks, Merit List and Counselling Dates. UP Polytechnic Result 2018 : Uttar Pradesh Board of Technical Education (UPBTE) has organized the JEECUP (Joint Entrance Examination Council of UP) examination on 22nd April 2018 in morning and afternoon sessions. Candidates seeking admissions into Polytechnic courses in the state of UP have applied and appeared for the test. This year a large number of students seeking admission to Polytechnic courses have taken the test as per the allotted slots. Students getting the qualifying marks in this examination are eligible to get admission into their interesting courses. The examination has been organized in a large number of examination centers across the state. Students those have appeared for the JEECUP and waiting for the JEECUP 2018 results need to check the official website, jeecup.org. The JEECUP Results 2018 are released. Hence students need to stay patient until the accurate result date is announced. At the time of result announcement, students can also download JEECUP score card 2018 to attend the counseling. Uttar Pradesh Board of Technical Education (UPBTE) annually organizes JEECUP (Joint Entrance Examination Council of UP) examination for aspirants seeking to get admissions in Polytechnic courses in the state of Uttar Pradesh. Candidates those have qualified their 10th class examination are eligible to attempt this state level entrance test. The students will get admission into polytechnic courses strictly based on their rank. While offering the admissions, the preference will be given in chronological order. Candidates securing the best ranks will be given admission in the first phase of counseling. Jeecup Cutoff marks caste wise will be update soon here. Students can download JEECUP scorecard at the time of the announcement of result. JEECUP rank will be announced along with the result. Students can visit the JEECUP official website, jeecup.org to check the rank and download the scorecard. Students those have qualified the examination with required marks can attend the JEECUP counseling in scheduled dates. The result/score of UPJEE (POLYTECHNIC) – 2018 for all candidates declared May 28th, 2018. This score shall comprise the actual marks obtained in UPJEE (POLYTECHNIC) – 2018 along with the status of those who qualify for appearing in UPJEE (Polytechnic) counseling – 2018. The results has Declared on 28th according to sources. Note: Results page Working Fine now. Server http error not displaying. you can stay here with the above links.So you can happily check the results, candidates can comment your marks/ rank below. Results was already announced. I. The result/score of UPJEE (POLYTECHNIC) – 2018 for all candidates will be declared by third week of May 2018. This score shall comprise the actual marks obtained in UPJEE (POLYTECHNIC) – 2018 along with the status of those who qualify for appearing in UPJEE (Polytechnic) counselings – 2018. II. Only the State Open Rank is used for all the groups separately for admissions through seat allocation while other ranks are for information purpose only. III. No score/rank card will be dispatched to the candidates. Candidates are advised to download their score/ rank cards from JEECUP website. IV. The answer keys of examination will be displayed on the website along with result. Candidates shall be offered admission based on their choices, reservation and State Open Rank of UPJEE (POLYTECHNIC)-2018 through a Seat Allocation Process to be announced later. The candidates will be able to make their choices online for branches and institutes at appropriate time. Candidates are advised to regularly visit the UPJEE (POLYTECHNIC) website www.jeecup.org and https://jeecup.nic.in for latest information. The verification of documents would be done at the time of Seat Allocation Process/admission. The purpose would be to verify different records regarding identification, age, qualifying examination, state of eligibility, category and disability (if any) of the candidate. On failing to produce any of the authentic documents, the candidate will not be considered for admission. SC, ST, OBC and PwD, MP, FF candidates will be required to produce original certificate issued by the competent authority at the time of Seat Allocation Process as well as at the time of admission, failing which they will not be considered for admission. How to Check JEECUP Results 2018 Online With Candidate Login Details? On the homepage search for the JEECUP 2018 Rank or Scorecard link and click it. Finally, click on the JEECUP 2018 Result that will be displayed on the screen and then Download your Result. Take the printout of the result for your future reference such as for counseling etc. 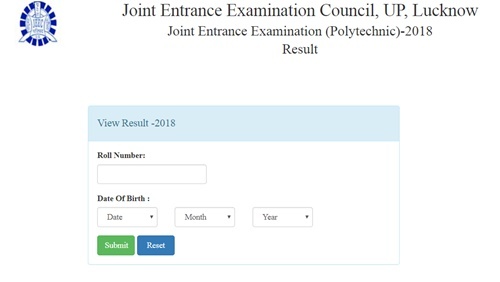 1.2 How to Check JEECUP Results 2018 Online With Candidate Login Details? I forgot my password. How will be counseling.